You wake up with the sun shining through your window. The bright glare is so much to bare that you draw the curtains before getting up to begin your day. Now picture this; you wake up and its as if your eyes are still shut or perhaps you cannot tell if the shades are drawn or if there even is a glare coming into the window at all. This is the reality for many who suffer from a visual impairment whether its complete blindness or partial. For these people, they may never know what the sun looks like or how bright stars shine at night. But outside of the world’s natural beauty, there is much more we use our sight for just to live independently. The folks at the Lighthouse of Collier County know the difficulties many face daily and are committed to doing their part in helping them live an empowering and independent life! 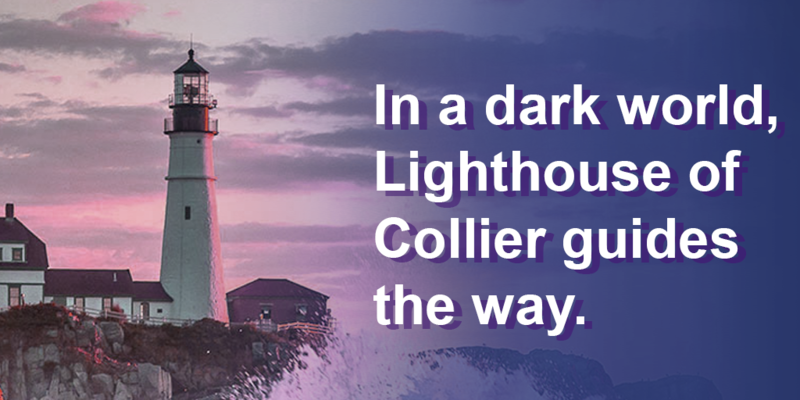 What is the Lighthouse of Collier County? Founded in 2009 and celebrating their 10th anniversary this April, the Lighthouse of Collier County (LOC) is a blind and visually impaired professional care service center. They provide training and rehabilitation services for people of all ages, at no charge, to help those in the community who are blind or visually impaired. All their programs are tailored to each individual’s specific needs and sessions (both group and individual) are conducted year-round. Being the only rehabilitation center for blindness and vision loss in Collier County, LOC has made a commitment to their community. However, actions speak louder than words! So, what have they done thus far to prove this commitment? Well, to date they have offered and provided services to roughly 14,000 children and adults in the Collier County only! Additionally, their goal is not just to help people get through today but to give them their independence back and help them get themselves through every day to come! And if that doesn’t shout commitment and care, I don’t know what does! Their mission is to foster independence and enhance the quality of life for the blind, visually impaired and their caregivers. We had the opportunity to speak with LOC’s Executive Director Scott Flagel and asked him to elaborate on their mission. “It’s very straightforward and simple; we are here for the blind, visually impaired, and their caregivers and the whole mission is to enhance the quality of their life”. He went on to say, “It’s not clinical in nature. It’s really to make sure someone can live independently and to make their life more manageable”. With the help of their elite staff and continued efforts, the Lighthouse of Collier holds a Guidestar Platinum Status and is nationally accredited by the National Accreditation Council for Blind and Low Vision Services. Everyone has a place to call home. Somewhere they have people they love and care for. And every home has a community with neighbors and like-minded people, who will defend and help their own. That mentality is the basis for how the Lighthouse of Collier came to be and 10 years later they still continue to take care of their home!